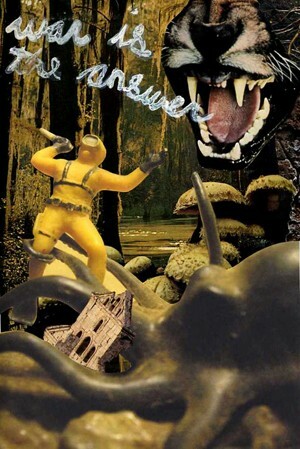 This piece, which portrays animals, fungi, and soil attacking civilized humans and their intrusive technology, is based on the writings of Derrick Jensen. Since our culture and civilization commits violence against the earth, against animals and plants, and against indigenous populations, why shouldn’t they in turn use violence as a means to save their own lives? I think a committal to non-violence in the face of genocide and ecocide is becoming more and more delusional – that is, not based on evidence. I see the signs around Baltimore in people’s yards that read, “war is not the answer,” and I think: well all the evidence points to the contrary. If the ultimatum is to fight back or die (and with an apocalypse unfolding all around us: mercury and plastic in fish, dioxin in breast milk, cancer rates skyrocketing, and so on, this is the actual ultimatum we’re left with), war certainly is the answer, right?